Thirteen years old Fany definitely went to other side of the Rainbow Bridge. She left us after wonderfull time which was very important for us. 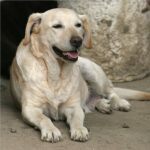 She was our first labrador, she showed us large soul of this great dogs. Thanks Fany we started to breed this wonderful breed and she taught us so much in communication with dogs. Our sweet Fany we will never forget to YOu and thank You for all. Hopefully we were so important to You as You are for us. We have no day without thinking about our Fany z Radíkovských šancí.